Congratulations to RSpec/Star Analyser user Giovanni Battista Casalnuovo for his recent exciting work studying asteroids. See his site for details: link. 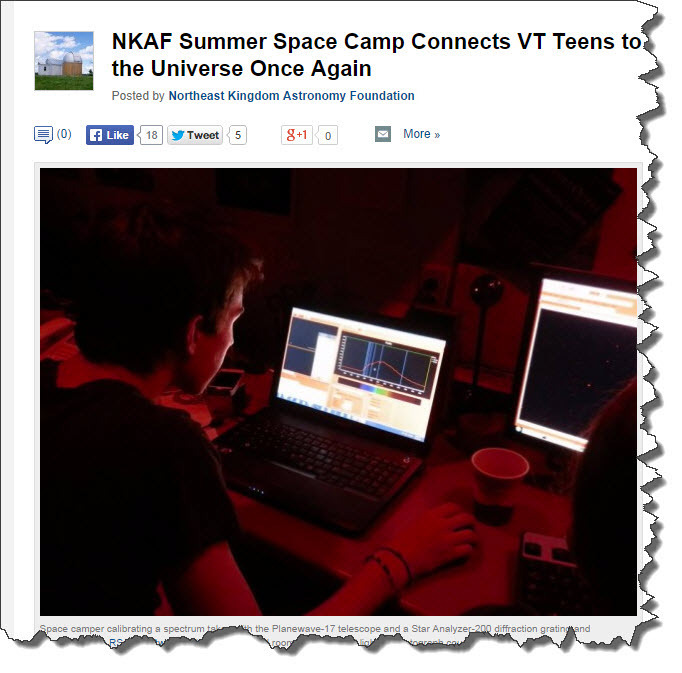 A recent posting on the National Geographic site mentioned RSpec being used by high school students at a summer space camp: link. Well known blogger and author Rod Mollise (a.k.a. “Uncle Rod”) recently took RSpec out for a series of tests using our Star Analyser grating and a ZWO video camera. 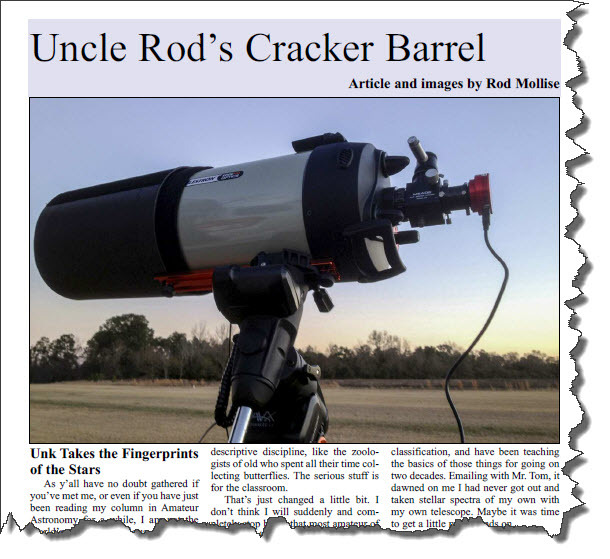 He wrote about it in Amateur Astronomy Magazine. For the complete article (pdf), click on this link. 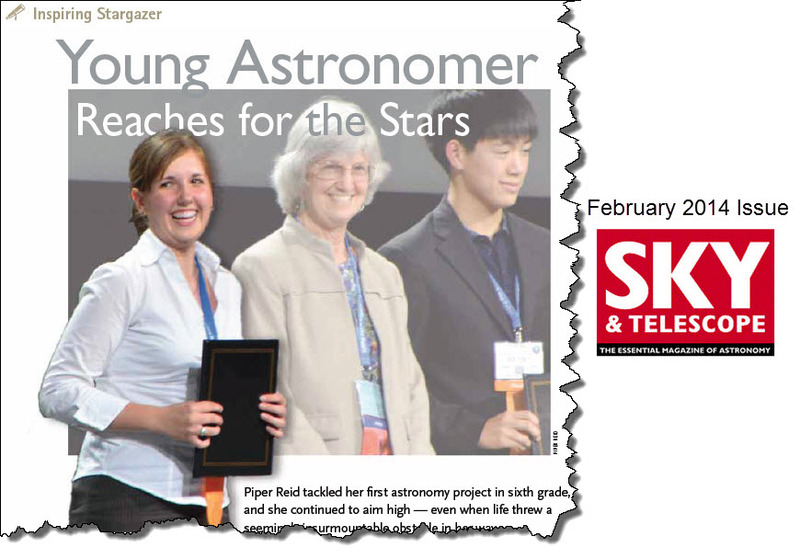 At a recent American Astronomical Society conference, we were approached at our booth by a high school student named Piper Reid. She came by to tell us that she had used our software on a project she recently completed, and which had been accepted for the conference poster session. 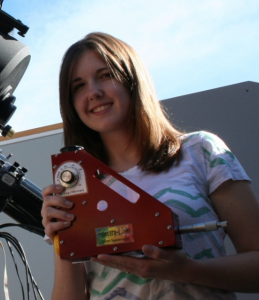 Her project was to measure the physical properties of a binary star system using photometry and spectroscopy. She measured the rotation period, separation, radius and mass of BB Pegasi and 57 Cygni. For more information and a downloadable copy of her paper, see this link. We’re also told (and, frankly, are somewhat envious!) that at the AAS Conference, Piper had the opportunity to explain her poster to COBE researcher John Mather (2006 Nobel Laureate in Physics) and also to physicist John Grunsfield, five-time Shuttle astronaut! Congratulations, Piper, on your project! We look forward to seeing more great things from you in the years to come. Article on how to use Webinars for Remote Presentations. Whether you’re an astronomy club, or high school classroom, Tom Field, the founder of Field Tested Systems can entertain and educate your group with a live video webinar on the the amazing field of astronomical spectroscopy. High school physics classes love Tom’s humorous and slightly wacky antics. ) 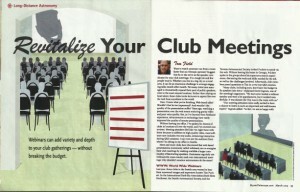 Tom’s article on using webinars for remote presentations appeared in the March issue of Sky & Telescope. Tom is available for free to speak to your club. See link for details. The Sierra Stars Observatory Network has begun to do spectroscopy with their network of professional observatories around the world: (link) Rich Williams has blogged about the process: link. 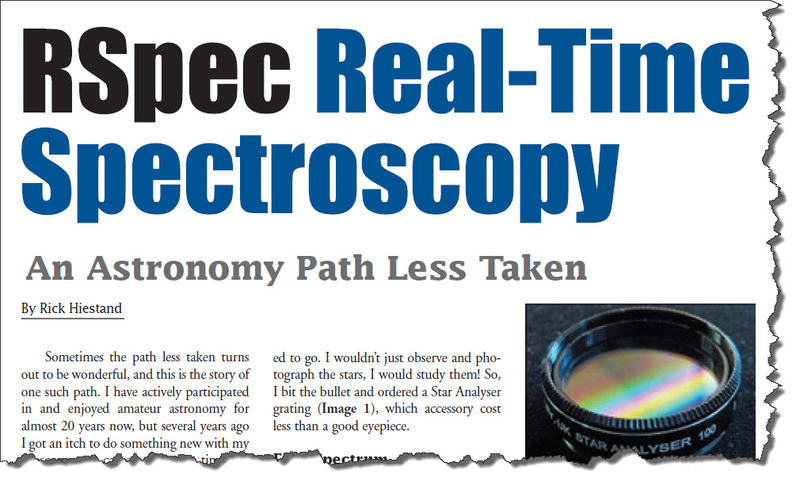 Long-time RSpec user Rick Hiestand has had his article on RSpec published in the US magazine Astronomy Technology Today. Right-click this link to save a pdf of the article to your computer. Or left-click to read it in your browser. At the NEAF astronomy conference this Spring, we had a drawing at the RSpec booth for a give-away of a Star Analyser and a copy of the RSpec software. We were excited that the winner was Benjamin Palmer. Benjamin lives near the NEAF conference site in New York State. He’s passionate about astronomy. 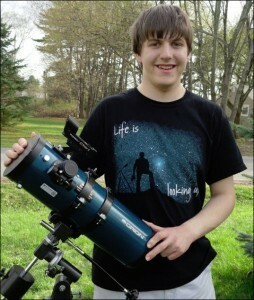 And, although he’s only 16 years old, he’s already quite well-informed on astronomical topics. We really enjoyed meeting and chatting him. His excitement is contagious. Benjamin enthusiastically says, “I can’t wait to undertake my newest research project, ‘A Spectroscopic Study of Alpha Cygni Variables’ using RSpec and my new Star Analyser grating.” We’ve exchanged several emails with him since the NEAF conference and we’re happy to say that Ben remains very excited about his plans for the upcoming summer observing season. Congratulations, Benjamin! We look forward to hearing more about your spectroscopic adventures! We predict a bright future for Ben! He’s shown in the photo with his 4.5 EQ reflector. RSpec Booth a big success at NEAF! The Seattle Astronomical Society invited RSpec’s Tom Field to speak at their club meeting, hosted at the University of Washington. Greg Scheiderer was there and wrote about his experience in the article below, which is no longer on-line. The University of Iowa’s Department of Physics and Astronomy has posted some nice comments about RSpec and spectra that they processed using the program: link. 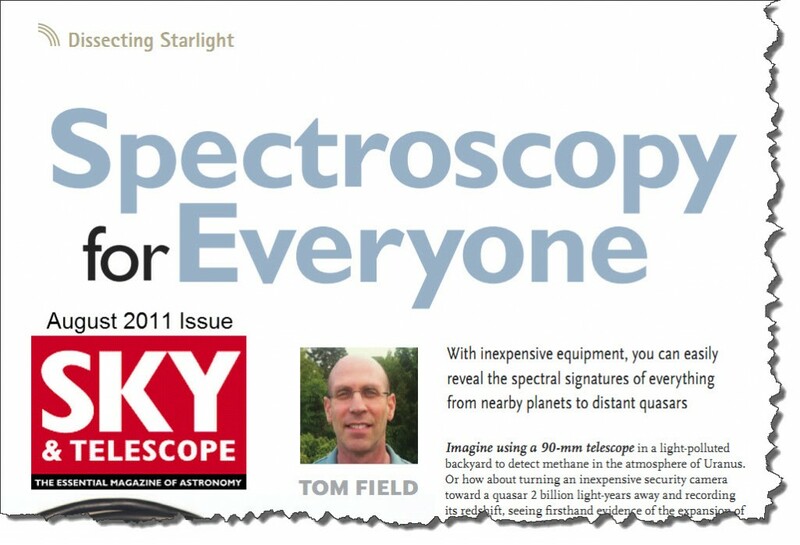 Ken Hudson recently published this interview with Tom about RSpec and the world of spectroscopy: link. 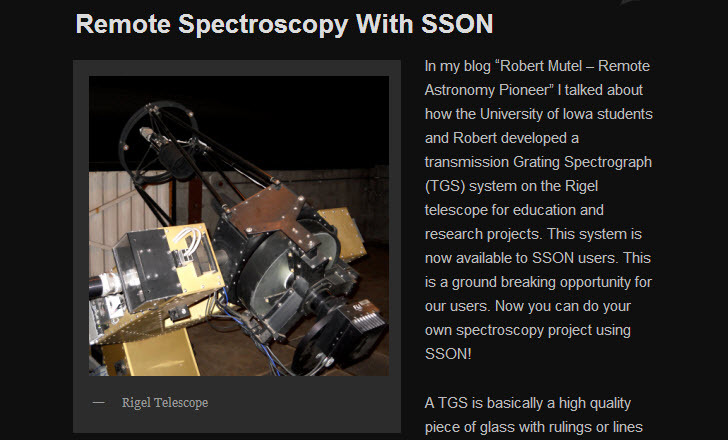 Mark DeVito featured Tom in their daily astronomy podcast where they discussed how to get into spectroscopy and how RSpec fits into the big picture: link. One exciting aspect of RSpec is that you can view spectra from a live video camera, including the astronomical cameras from The Imaging Source, who published this link. The August 2011 issue of Sky & Telescope Magazine contained four-page article by Tom on spectroscopy. Download pdf: link. Jeff Hopkins [deceased] was an amateur astronomer who studied Be stars. He was part of a still growing community of amateurs working with the pros. 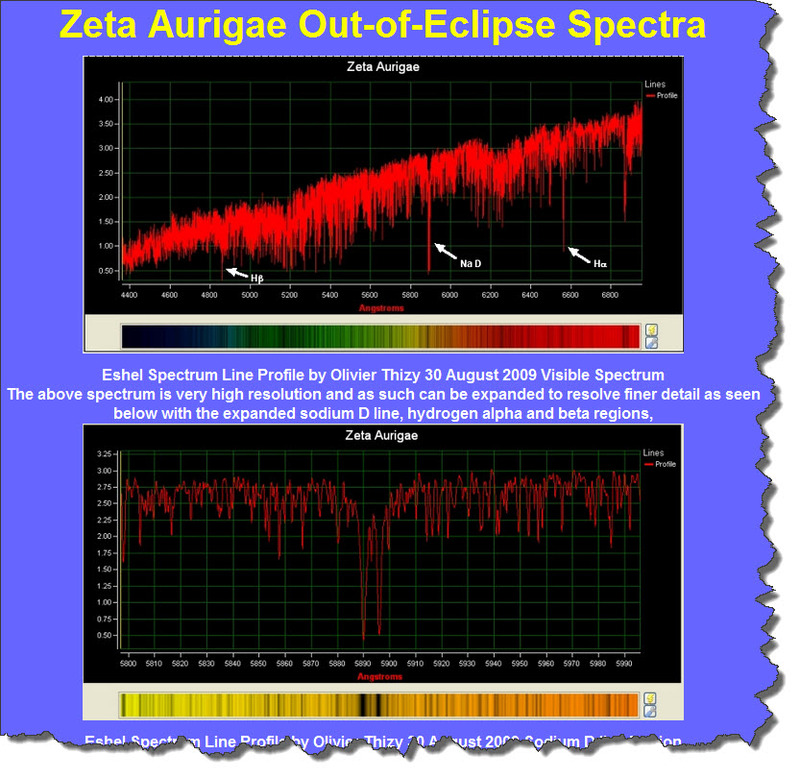 His Zeta Aurigae campaign site (no longer available) had some nice examples of RSpec being used to study Be eclipse data.